When unemployed San Francisco reporter Chuck Townsend and his college-dropout son, Justin, take a cruise to Mexico in 2016, each hopes to rebuild a relationship after years of estrangement. But they find more than common ground aboard the ship. They meet a mysterious lecturer who touts the possibilities of time travel. Within days, Chuck and Justin find themselves in 1900, riding a train to Texas, intent on preventing a distant uncle from being hanged for a crime he did not commit. Their quick trip to Galveston, however, becomes long and complicated when they wrangle with business rivals and fall for two beautiful librarians on the eve of a hurricane that will destroy the city. Filled with humor, history, romance, and heartbreak, SEPTEMBER SKY follows two directionless souls on the adventure of a lifetime as they try to make peace with the past, find new purpose, and grapple with the knowledge of things to come. 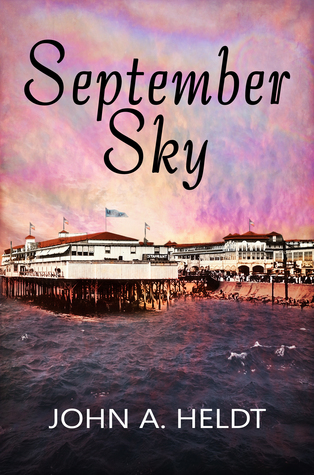 Time travel writer John Heldt begins the American Journey series with his novel, September Sky. Father and son, both at a point in their lives where they're uncertain what lies ahead, appear on the receiving end of a ticket to the year 1900. Charles and Justin Townsend, after a bit of consideration, jump at the chance to visit another era. But if it's up to them, they won't be just innocent bystanders. Justin Townsend has just broken up with his girlfriend and dropped out of medical school. He's confused, lost, and lonely. Taking a trip and gaining perspective is exactly what he needs. Justin is an honest man. He's dedicated, persistent, bright, smart, and very likeable. Readers will be able to connect with Justin emotionally because of his relationship experience at the beginning. That connection will only grow as readers watch him fall in love again with a spunky, witty woman from 1900. Readers will definitely connect with both Chuck and Justin. They're both very down to earth characters with a slight to-good-to-be-true air. Chuck is a little corny at times, though it's probably a historical trait. Justin is a considerate and sweet young man who steals the hearts of many in this novel. But when thinking of time travel and the possible butterfly effect, I don't think it was very wise for Chuck and Justin to try to alter history. Perhaps that's what the series will pick up on in the next book? I feel like there has to be consequences for certain actions, but maybe not. Heldt does a good job in surprising the reader at the end and explaining certain character decisions. Definitely looking forward to seeing what happens next for the time travelers.